The smell of warm baked apple pie fills your home and you can’t help but smile! If the thought pops in your mind soon after of, “Yes, it smells so good and is so nostalgic, but I won’t eat it now because I’m trying to maintain my figure” … you can now get rid of that! 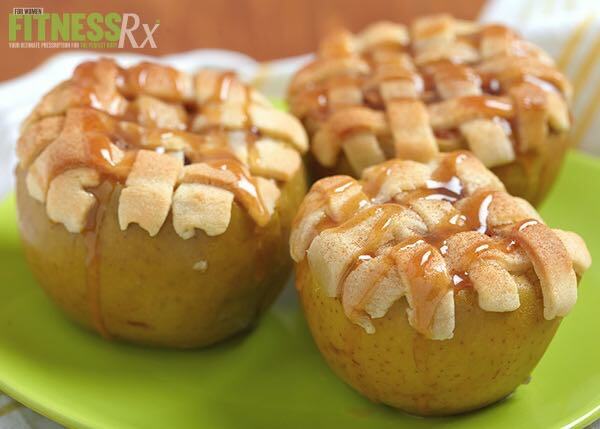 My Apple Pie Baked Apples are a creative, healthy, yet still delicious spin on the standard apple pie. They are lower in calories, sugar and fat! So now you have your pie and eat it, too! Typically when I write my recipes I will just list a generic whey, casein or blended protein in the ingredients. However, every once in a while I come across a protein that I just can’t help but mention and Jamie Eason’s signature protein line has led me to do just that! Enjoy! 2. PREPARE CRUST: Put oat flour, protein powder, and salt into a mixing bowl and stir to combine. Add coconut oil and mix with a fork (breaking down coconut oil into dry mixture as needed) until mixture resembles coarse meal, making sure there are no large chunks of coconut oil. 3. Add yogurt and then ice water a tablespoon at a time, and continue to mix with a fork, just until dough begins to come together (don’t overmix). 4. Turn dough out onto a cutting board or a smooth surface and form into a flattened round with the palm of your hand. Wrap tightly with plastic wrap and refrigerate at least an hour (or overnight), while you prepare the apples. 5. Wash apples and cut the tops of three of them (do not peel). Use a knife and carefully hollow out the core and some of the apple to form your apple shell. 6. Place apples in a small glass baking dish so that they are close together and stand upright. 8. Divide and spoon apple mixture evenly into your apple shells. Lightly pack and fill to the top (you will have a slight overfill). 9. Remove the pie crust from the refrigerator and roll out nice and thin onto a lightly floured surface. Cut strips about 4 in. long by 1/2 in. wide. 10. Place 6 strips of the pie crust onto each apple in a lattice pattern (you will most likely have extra crust leftover). 11. Bake apple pies 30-40 minutes until crust is golden brown and the apple is nice and soft when pierced with a fork. 12. Carefully remove apple pies and allow to cool 10 minutes before moving out of the dish. Enjoy! OPTIONS: Top with sugar-free caramel sauce and/or extra cinnamon and stevia for added sweetness.